You keep putting off buying those gifts for family and friends because you’re just not sure what they like. Don’t take the chance of “wasting” a gift on something they don’t like or can’t use. Here’s the answer. Give them one or more of our “Pure Cajun Products” gift certificates and you can’t go wrong. Let them pick out their favorite foods or gifts. What can be easier then that? No traffic, no crowds and no “wrong” gifts! 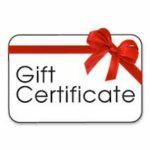 We’ll mail the gift certificate (As shown above) to the person of your choice with your name filled in after “Merry Christmas from:” or “From” field for certificates sent anytime during the year. Just send us their name and address. Can’t get any easier than that!